We invite you, challenge you, to enter this world, inhabited by an eclectic array of performers who have taken over the space and are selling their wares. It is up to you whose performance gets your cash. As you roam the building our companies and artists will be competing for your coins, but whether it be 10p or £2 – you choose what you want to spend on their shows. Entrance price (£10/£8 concessions) gains you entry to the building, and access to the free areas. Beyond this each performance incurs a cost but you are free to set your price (this might be 10p, a £1 etc). 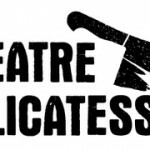 Described by The Observer as one of the “Bright Young Things Changing British Theatre”, Theatre Delicatessen create ensemble led, immersive performances magnificent empty buildings across Central London. Formed in 2007, by directors Jessica Brewster, Frances Loy and Roland Smith, with producer Mauricio Preciado Awad, Theatre Delicatessen are pioneers of the pop-up theatre movement, creating performance spaces in a derelict college building on the fringes of London’s Oxford Street, a disused workshop at 295 Regents Street and the old BBC London Studios in Marylebone. Their highly acclaimed previous productions include a sell out all- female production of A Doll’s House, and the Time Out Critics’ Choice event Theatre Souk and Pedal Pusher – one of Time Out’s theatre highlights of 2009, and a 2010 Edinburgh Festival hit. Other companies and artists performing in Bush Bazaar include Old Bomb Theatre, Hobo, Pelegrino, Birds Anonymous, Erica Miller, Limbic Productions, Joanna Turner, Juliane Von Sivers, Tea Fulled, Stamp Collective, Amanda Castro, Paper Tiger, Catherine Harvey, Annie Saunders, Populace Theatre, Sophie Rebecca Grodin, Afsanah Gray, Les Foules, Silent Opera, The Lab Collective and Halfcut.